The three-year long siege of Leningrad marks one of the most dramatic and emotionally crushing moments of World War II. The German blockade around the city resulted in the death of 1 million Red Army soldier with an additional million in civilian casualties. 3200 residential buildings, 9000 wooden houses, 840 factories and plants were also destroyed and it took decades until the city could recover. Written and directed by Aleksandr Buravskiy, Leningrad is a cinematic re-enactment of the battle as told through the perspective of a handful of survivors stuck inside the city walls. Starring Mira Sorvino, Gabriel Byrne and Armin Mueller-Stahl, Buravskiy's film is one of the most epic undertakings of post-Soviet Russian cinema. 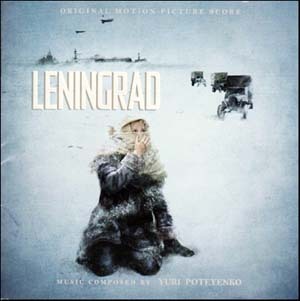 The score to Leningrad was written by Yuri Poteyenko whose career we've been following since his acclaimed video game scores to his more recent movies written for Timur Bekmambetov. Just like the movie itself, the score represents a high points in its creators filmography, a complex and exciting collection of cues that cover everything from wartime heroics to civilian sacrifice and mindless destruction. The score is peppered with references to European classical music from "Adagio in G minor" to "Benedictus" and selected homages to the inescapable Dmitry Shostakovich. Conducted by Igor Dronov and performed by the Moscow Studio Symphony, our release of the scores contains all the important moments of the score, including cues that only appeared in the extended version re-edited for television. Friend from Russia has a couple new releases that I just found out, I am looking forward to having this in my collection.